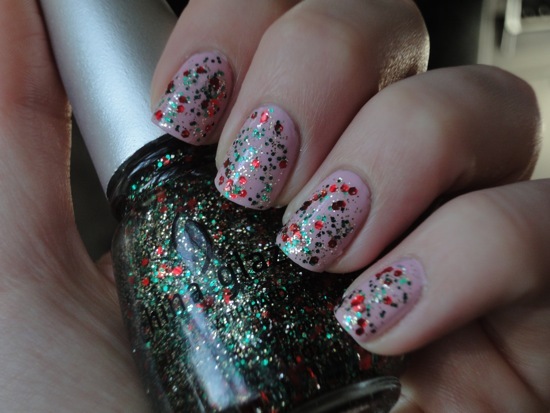 After some research, I ordered Something Sweet from the China Glaze Up & Away Collection from Spring 2010, a pastel pink. This was all months before the Holiday collection was released. I was finally able to combine these two polishes this past weekend, and I’m so happy with how it turned out! Something Sweet is sugar-y pink and has an almost lilac hint to it; it reminds me a little bit of Little Debbie snack cakes or frosting. It’s not baby pink or Barbie pink, it’s a little more blue than many pastel pinks. 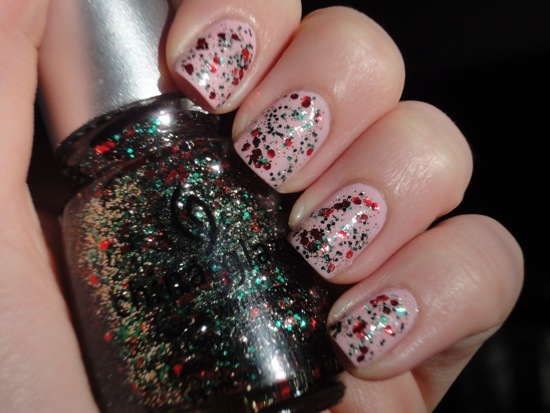 And Party Hearty is so pretty over it–this looks like Christmas candy with crinkly packaging, sweet and girly. Mission accomplished!